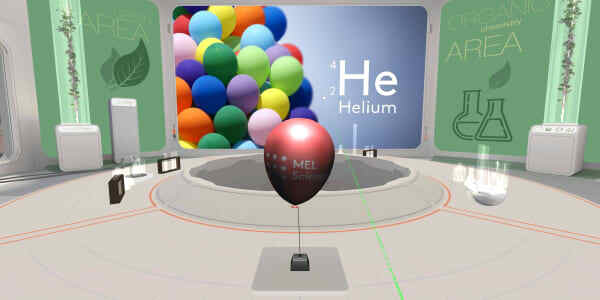 You will zoom inside a helium balloon and see that helium gas consists of atoms that are flying. 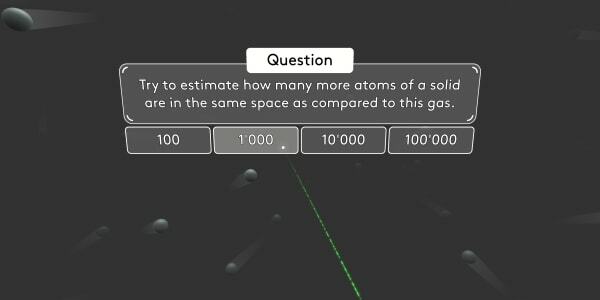 You will see that atoms in gas are further away from each other than in solids. Finally, you will see how atoms start flying faster if you increase the temperature. 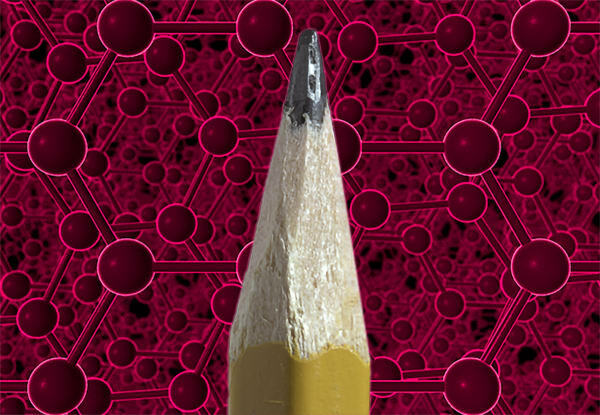 In our pre­vi­ous les­son you saw that solids con­sist of small atoms that are vi­brat­ing. Now, what about gas­es? 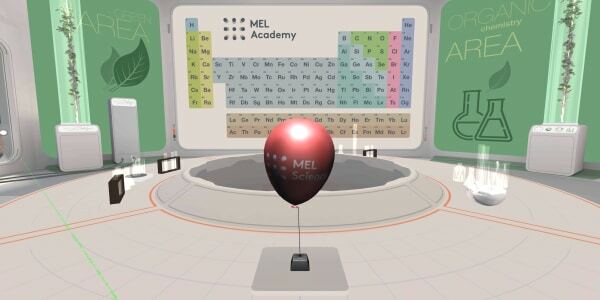 We have a he­li­um-filled bal­loon in our lab. Cer­tain­ly you've seen bal­loons like it at birth­day par­ties. 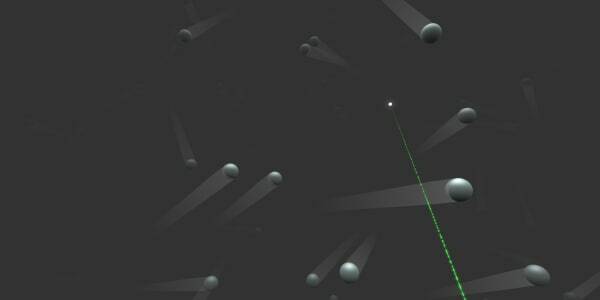 We have to zoom in a bil­lion times to see the in­di­vid­u­al atoms. You can see that he­li­um gas is made of small he­li­um atoms, but these atoms are much fur­ther apart than the ones we saw in a di­a­mond. In real life the atoms don't stay still. Re­mem­ber, in solids they vi­brate. 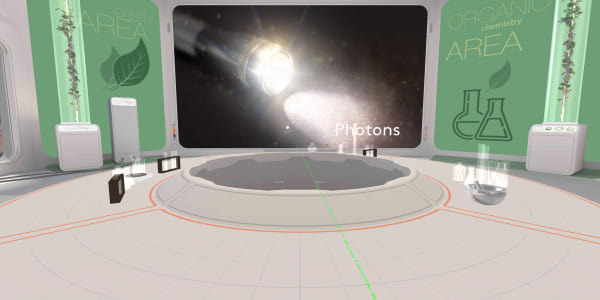 Let's switch time on and see what hap­pens in a gas. Ready, steady, go … . This gas is at nor­mal room tem­per­a­ture, but what will hap­pen if we in­crease the tem­per­a­ture? Let's heat the gas to 1000 de­grees. You see our atoms are fly­ing much faster. Ac­tu­al­ly, such ran­dom atom move­ment is what we call tem­per­a­ture. The faster atoms fly or vi­brate, the high­er the tem­per­a­ture will be. Take a few mo­ments and fly around in­side. You're now as small as an atom. 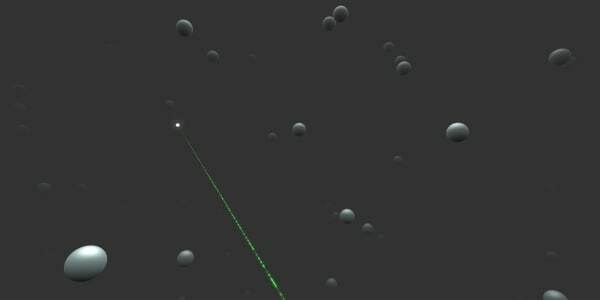 The next time you're at a birth­day par­ty and you see a he­li­um bal­loon, you can tell your friends that you flew in­side the same kind of bal­loon and saw these tiny atoms. Re­mem­ber that, in the pre­vi­ous les­son, you saw that in solids the atoms are close to­geth­er. How­ev­er, in gas­es there is plen­ty of space be­tween atoms. 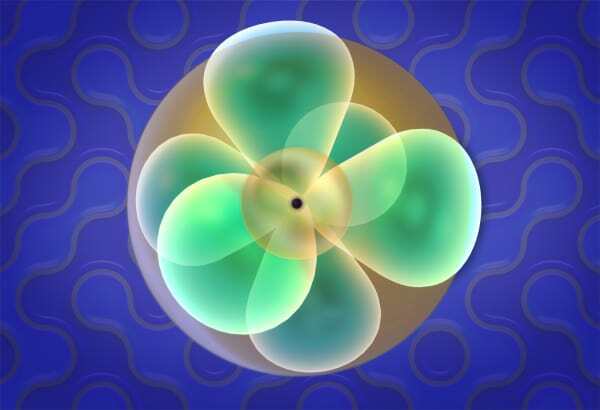 That's why gas­es are much lighter than solids: There are far few­er atoms in the same vol­ume. Try to es­ti­mate how many more atoms of a sol­id are in the same space as com­pared to this gas. 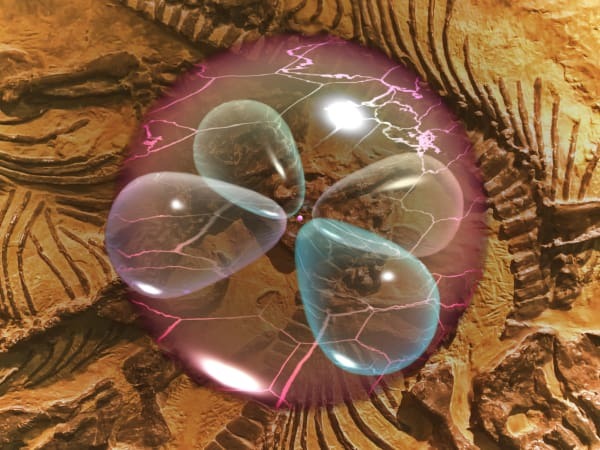 There are about a thou­sand times more atoms in the same space in solids com­pared to gas­es. That is why gas­es are, on av­er­age, about a thou­sand times lighter than solids. Now we have a tricky ques­tion for you. 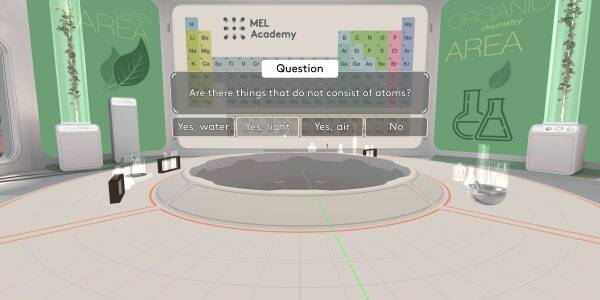 Are there things that do not con­sist of atoms? Not ev­ery­thing con­sists of atoms. Light, for ex­am­ple, con­sists of pho­tons, which are dif­fer­ent kinds of par­ti­cles with dif­fer­ent prop­er­ties. 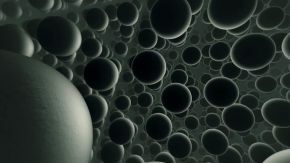 Gas­es are not mat­ter be­cause we can't see them or feel their mass. The goal is to demon­strate how much denser liq­uid and sol­id ob­jects are com­pared to gas­es. Ask stu­dents to de­ter­mine (make mea­sure­ments with a set of weights and then count) how many he­li­um bal­loons a stu­dent needs to lift him/her up in the air. Equip­ment: bal­loons filled with he­li­um, set of weights. The goal is to show stu­dents how pow­er­ful gas par­ti­cle mo­tion is. Ask stu­dents to pull out a sy­ringe plunger and keep it in place with their fin­gers. Let them see how easy they can do it. Then ask them to close the hole with their fin­ger and pull out the plunger again. Let them feel that it be­comes much hard­er to hold the plunger so that they can see how rig­or­ous­ly gas par­ti­cles move and hit ev­ery­thing around. The an­cient Greek the­o­ry that air was one of the ba­sic el­e­ments. Dis­cov­ery of dif­fer­ent gas­es in the air. Our knowl­edge about air as a mix­ture of gas­es. Par­ti­cle mo­tion in gas­es: un­der a mi­cro­scope, we can see the Brown­ian mo­tion of tiny smoke par­ti­cles in the air. It proves that air con­sists of tiny par­ti­cles mov­ing chaot­i­cal­ly. 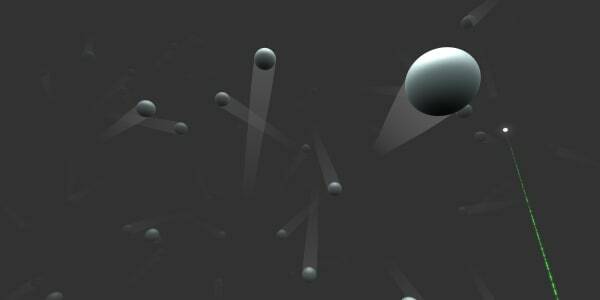 How do we know that there are gas par­ti­cles around us if we can't see them? The speed of gas par­ti­cles. How much denser are solids than gas­es? Bil­lions of gas par­ti­cles are hit­ting us, why don't we feel it? If you stretch out the palm of your hand, you ac­tu­al­ly hold about 100 kg of air. The heav­i­est gas is sul­phur hex­aflu­o­ride. If you pour this gas in the tank a tin foil boat would float on top of it. Air is rough­ly 1,000 times less dense than wa­ter. 1 cu­bic me­ter of wa­ter weighs 1 ton or 1,000 kg, while 1 cu­bic me­ter of air weighs ap­prox­i­mate­ly 1.3 kg. 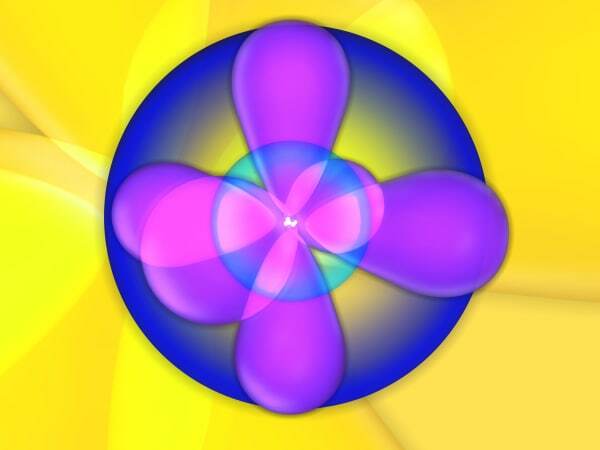 Why can gas­es change their shape and solids can't? Why can gas­es change their vol­ume and solids can't? What is denser gas or sol­id and why? In Chi­na, one of the world’s fastest trains can reach a speed of 430 km/h (ap­prox­i­mate­ly 0.2 km/s). In the air, oxy­gen par­ti­cles trav­el at around 500 m/s. Which is faster oxy­gen par­ti­cles or the train?